Challenge 1: Who has the best single? Kelly Clarkson and Leona Lewis both launched their albums with the release of an original song as a single. Leona scored her first UK top 3 hit in years with ‘One More Sleep’ and Kelly Clarkson appeared in the charts around the world with the single ‘Underneath The Tree’. Both singers actually released excellent and fitting Christmas singles. Catchy? Check! Huge sing-along chorus? Check! Sweet lyrics about wanting to spend Christmas with a boyfriend? Check! Overall uplifting Christmas mood? Check! Leona and Kelly both delivered songs that could and should become classics that will be heard at Christmas time over the next few years. I hope radio here will play these songs instead of ‘Last Christmas’ for the tenth time in a few hours. Because both singles completely passed the test, it is hard to choose one, but Leona’s song is basically one enormous catchy chorus that never ends. Although Kelly’s single has a great chorus and a very typical holidays sound as well, it is not as endearing and does not have that little Motown twist that makes Leona’s ‘One More Sleep’ so adorable. Well done both ladies, but Leona wins the first challenge. Challenge 2: Who has the best video? Now this is an easier choice. Both ladies recorded a video for their single. Kelly recorded a performance from her Kelly Clarkson’s Cautionary Christmas Tale TV special, mixed it up with some backstage footage and released it. Although Leona’s video is a bit low budget as well, it features the singer celebrating Christmas with her friends. All clichés of decorating the house, having dinner and a snowball fight are there, but the happy vibe and enthusiasm actually work pretty well. Leona is on a roll, people! Challenge 3: Who has the best original songs? Kelly and Leona both released some original tracks on their albums. Kelly co-wrote and recorded five new songs, while Leona worked on three new ones. Other than ‘Underneath The Tree’, Kelly has two more Christmas smashes waiting to be a single. The title track ‘Wrapped In Red’ shows off her brilliant vocals and the lyrics are smart and not too predictable. The song has a powerful chorus with a strong melody. Also, the sweet ‘Winter Dreams (Brandon’s Song)’, written for her husband, is brilliant in all its happiness and uplifting mood. The melody really reflects the lyrics and it all comes together brilliantly in the key change on the last chorus. Leona’s two original songs are hit and miss. ‘Mr. Right’ is cute and has a great motown vibe with a lovely chorus, but ‘Your Hallelujah’, although being a beautiful song which fits Leona’s voice, does not work well on the album and misses some Christmas spirit. Kelly Clarkson therefore wins this one, her first point right there! Challenge 4: Who sings the best covers? 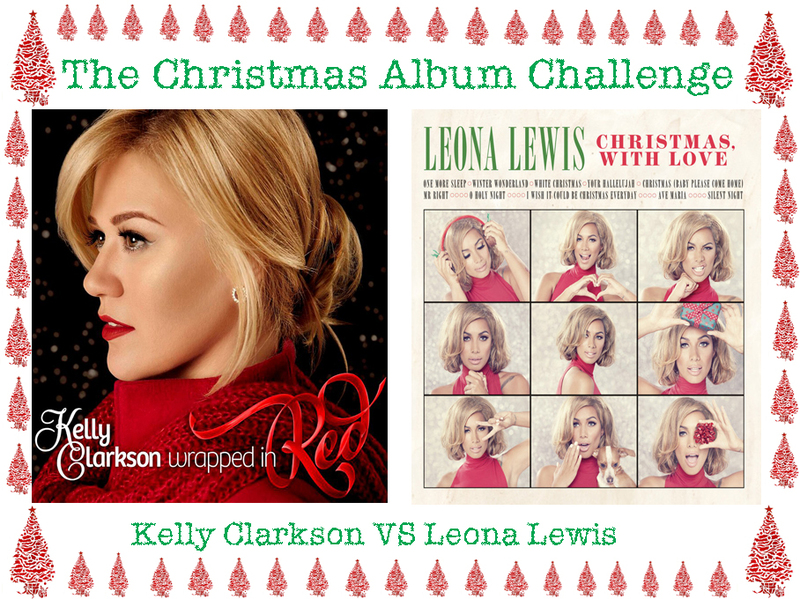 Both Kelly and Leona chose to do some more traditional covers instead of more recent Christmas songs. As we all know, both have incredible voices so they are able to make almost every song sound great. Leona brings one of the most addictive and swinging versions of ‘Winter Wonderland’ I have ever heard and her operatic rendition of ‘Ave Maria’ is gorgeous. Kelly however, delivers a better version of ‘White Christmas’ and her ‘My Favourite Things’ and ‘Just For Now’ are great choices for this album. Although both singers delivered very good renditions of Christmas classics, Kelly brought us a greater variety of lovely songs, like the jazzy ‘Baby It’s Cold Outside’. Therefore Kelly wins the fourth challenge, and makes the scores even again. Challenge 5: Which albums works best as background music during Christmas dinner? Of course both albums are perfectly suitable for this and I would recommend anyone to play one of the albums during the lunch and the other during dinner, because they are both worth it! If I would have to choose however, I would go with Kelly Clarkson, because her album is somewhat more diverse and creates the Christmassy atmosphere slightly better than Leona’s effort does. This means that Kelly Clarkson took over and won the fifth challenge as well! And the winner is… Kelly Clarkson!